Running intervals on a treadmill can ramp up your calorie burning. Many people enjoy running or jogging in the great outdoors, but not everyone enjoys the outdoors when it's raining cats and dogs or blowing snow sideways. This is why you have the comforting option of running on the treadmill at your gym or in your home. 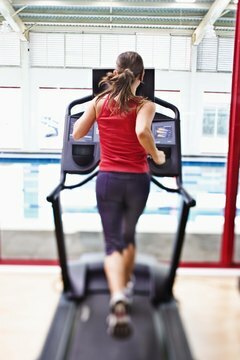 And stepping up your treadmill workout with intervals can provide you with the maximum calorie burn you desire. Interval training involves varying between periods of high-intensity exercise and low-intensity exercise as opposed to steady-state exercise, which involves continual low-intensity cardio for extended periods. 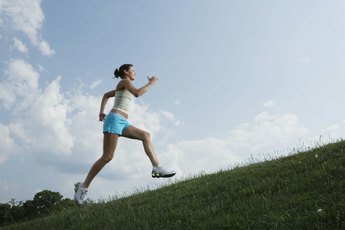 You can perform interval training while walking, running or during any other cardio exercise. When walking on a treadmill, for example, you can vary between one minute of walking at 3.5 mph and two minutes of walking at 2.5 mph. Interval training on a treadmill can provide you with the maximum calorie burn you desire as well as other benefits. By stimulating your cardiovascular, respiratory and nervous systems more intensely than steady-state exercise, interval training burns more overall fat and calories. In addition, the intense exercise of interval training requires your body to continue burning fat and calories after you work out in order to repair muscles and replace depleted energy stores. Interval training also causes your body to produce fat burning enzymes. According to Harvard Medical School, 30 minutes of low-impact aerobics for a 155-pound person burns 205 calories. In comparison, the same research shows that 30 minutes of walk/jog intervals with less than 10 minutes of total jogging for a 155-pound person burns 223 calories. 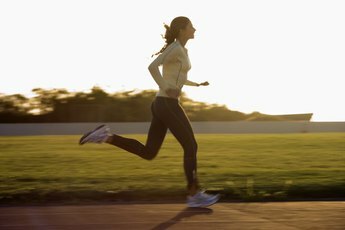 When doing walk/jog intervals, which are much less intense than most forms of intervals, you would need to work out for 27.5 minutes to burn the same 205 calories from 30 minutes of continual low-impact aerobics. And, these figures don't even count the continued calorie burning that intervals cause after your workout is over. 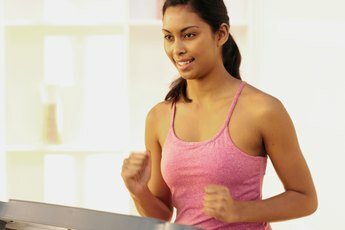 When performing interval training on a treadmill for the first time, it's important to start off slowly. First, warm up your muscles by walking for at least three to five minutes at about 2.5 mph with no incline. Once you're warmed up, you can begin your first interval by increasing the speed to 5 mph and raising the incline to 2 percent for one minute of jogging. Following this minute of higher-intensity exercise, lower the incline back to zero and decrease your speed to 3 mph for two minutes of low-intensity exercise. Repeat this light interval at least two more times. Consult your physician before beginning any treadmill interval-training program. Begin treadmill interval training with very light exercise intervals, but as you complete more training, you can increase the intensity as well as the number of intervals you perform during each workout. Once you become more experienced with treadmill intervals, you can vary the intervals more intensely with higher inclines and higher speeds, but always remain cautious and don't push yourself too far. 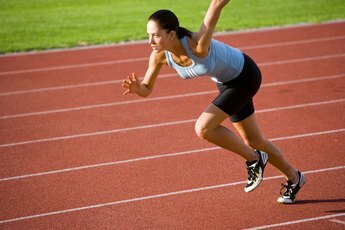 Yogawiz.com: How to Burn Calories Using Interval Training in Cardio? Scott Friedman is a writer based in Bend, Ore. Friedman was a technical writer for a USAID contractor and a community health system. He writes for various magazines and websites while running a proposal development firm, BDC International. He holds a B.A. in international affairs from George Washington University.